Formulation: Liquid. In 50mM HEPES, pH 7.4, containing 100mM sodium chloride, 0.5% CHAPS, 1mM EDTA, 10% glycerol and 10mM DTT. Specific Activity: One U=1 pmol/min at 30°C using Ac-VEID-pNA (200mM; Prod. No. BML-P437) as substrate. Application Notes: Useful tool to study enzyme regulation and kinetics, cleave target substrates, screen for inhibitors. Scientific Background: Effector caspase responsible for the cleavage of nuclear lamins in apoptosis. Caspase-6 cleavages of various other protein targets have been implicated in the pathogenesis of neurodegenerative diseases, including Alzheimer’s disease (b-amyloid precursor protein), Huntington’s disease (huntingtin). 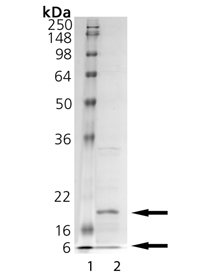 SDS-PAGE Analysis - Lane 1: MW Marker, Lane 2: 1 µg Caspase-6.